My Mom has a brand-new kitchen. And I am so in love with it I can’t stand it! Isn’t it gorgeous?! 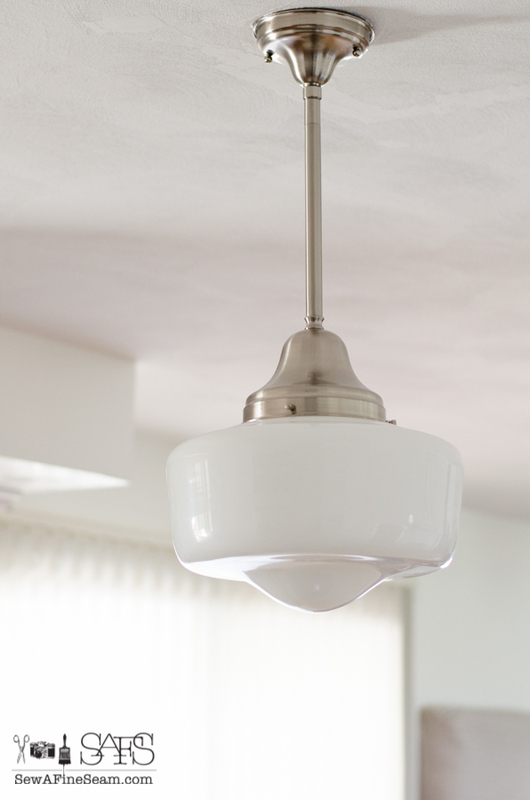 I love the white – I’m sure you knew that – and I’m so happy my Mom picked white for her kitchen. 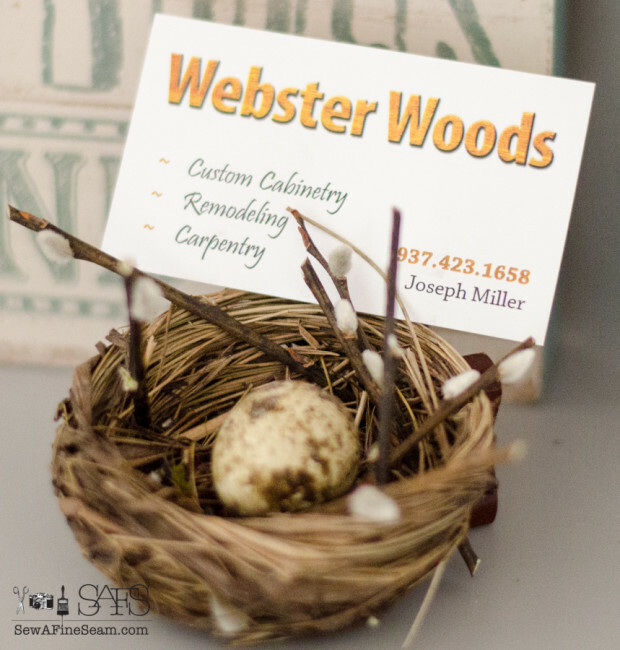 I have to chuckle just a little because she’s always been a wood lover, and has refinished some beautiful antiques over the years. 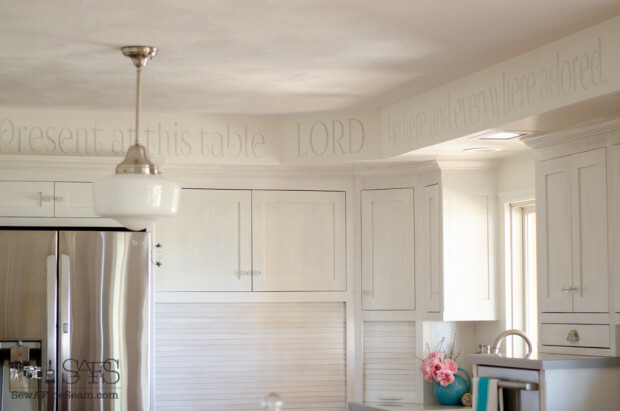 When she decided she wanted them painted I was thrilled because I love white painted cabinets. One night when I was unable to sleep the thought hit me that if she wanted those cabinets white they should be painted with milk paint. The cabinets would be custom made in a cabinet shop and the wood would be raw wood. 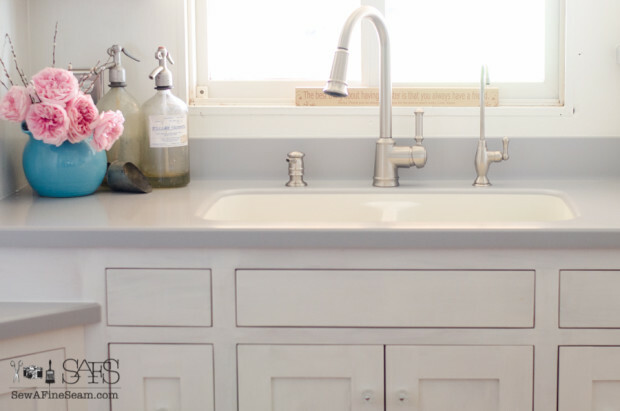 Milk Paint is PERFECT on raw wood. I pitched the idea to her and after she thought about it awhile she agreed. 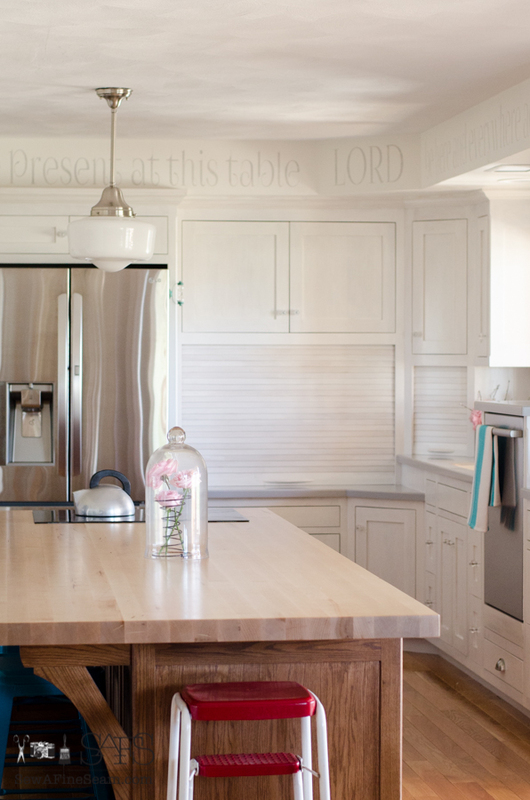 And so not only does my Mom have a new kitchen, she has Custom Kitchen Cabinets PAINTED with Milk Paint! My cousin is the cabinet maker. And he was a bit intrigued with the idea of milk paint. And he was rather impressed with it when I started using it and showed him how you mixed it up and how it went on. He was kind enough to clean out his garage that is attached to his cabinet shop, move the cabinets in there and let me paint them there. I spent 50 hours painting and used approx. 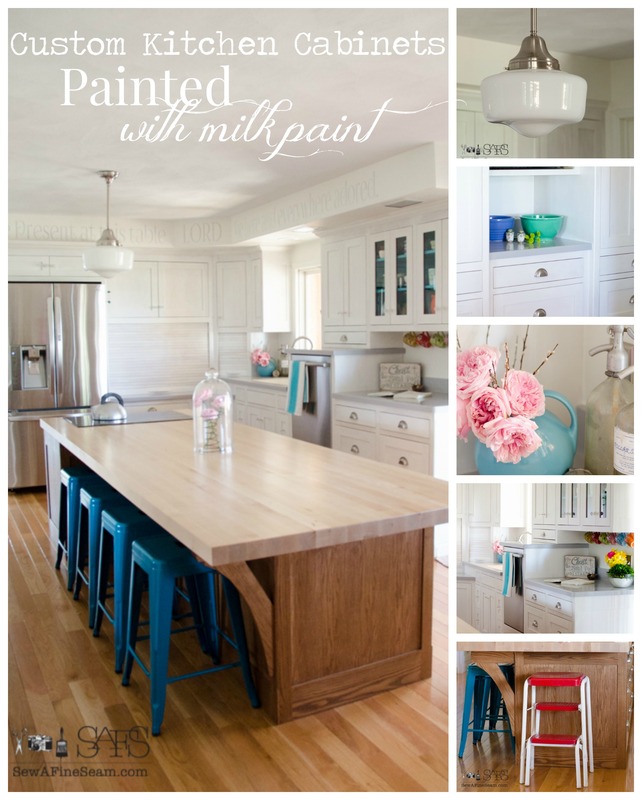 9 quarts of milk paint. I used Miss Mustard Seed’s Milk Paint in Ironstone. I painted the cabinets and inside of the doors with 2 coats of paint and the outsides of the doors got 3 coats. The doors were made at a different shop and the wood seemed to hold the paint different, plus they had much more surface area and I just felt like at least some of them needed more than 2 coats. Some of the larger areas of the cabinets, like beside the refrigerator, also got 3 coats. 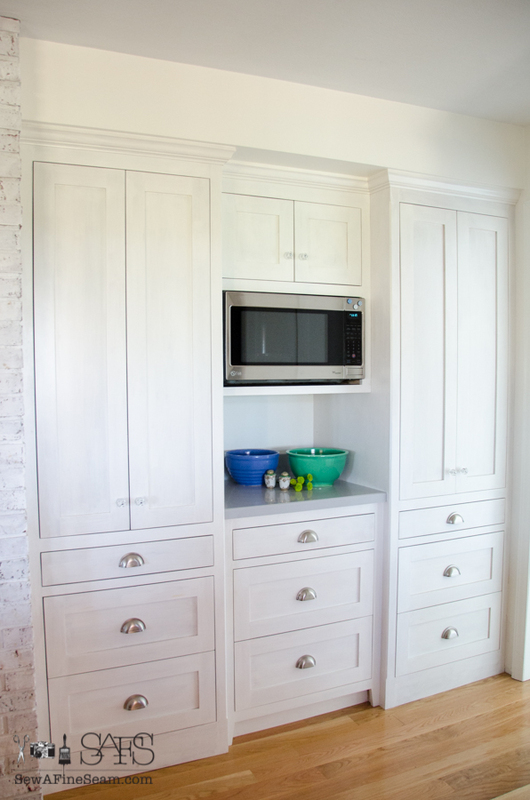 When I was finished painting, the cabinet maker sprayed them with the finish he uses on all his cabinets. I wasn’t about to wax or hand finish all those 🙂 Besides, that sprayed on finish just can’t be beat for durability in kitchen cabinets. Here is one before pic I managed to dig up. I will get some pics from my Mom that show more of the before and also get some old snapshots and scan them to show you what it looked like while I was growing up! I stenciled her soffit with a prayer Mom chose. You can see the details on how I did that here. Beyond this wall, window, and the door to the right of the cabinets there is some construction going on – my Mom is getting a new room added on and it’s going to be pretty cool too. My Dad is doing all the work so far (he did have the basement floor underneath poured by a concrete guy) and he’s having so much fun. Being retired suits my Dad really well. 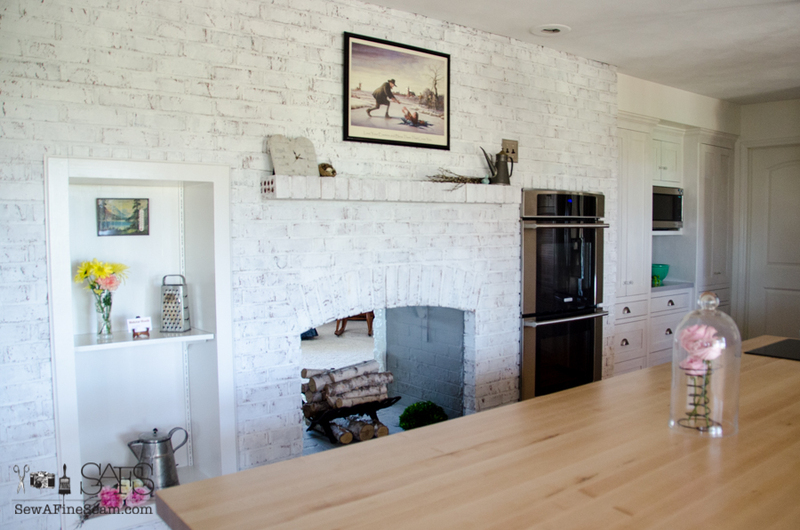 The other side of the kitchen features that painted brick wall I shared a few years ago. It’s holding up well and still looks great. My parents never use the fireplace anymore so I can’t tell you how the painted brick would do if you were using the fireplace but I can say that after over 2 years this one still looks just like it did when I first painted it. I love this area. This is where the old cooktop was with counter on either side. I really must find some more before pics and post some before and after comparisons. These bowls. I love how they look in the new kitchen. They are both family heirlooms and are antiques. 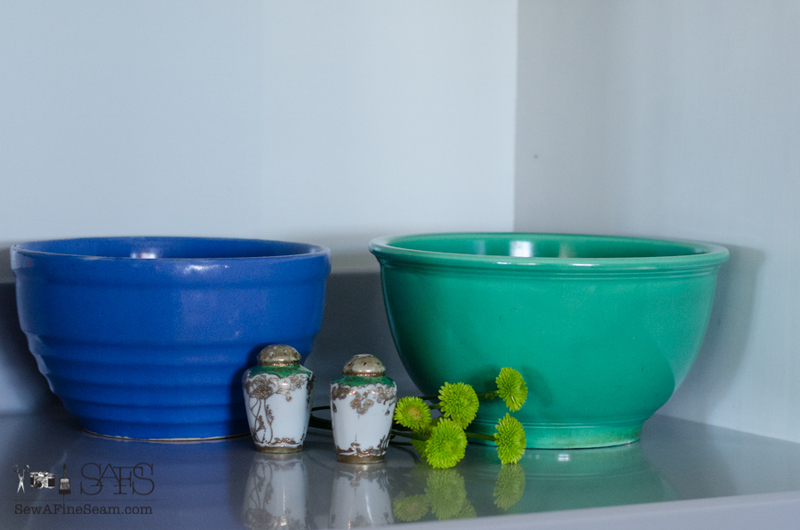 The blue bowl on the left belonged to my paternal Grandma, Pearl King. She used it to take potato salad to people when they had a death in the family or some such thing that called for ‘taking over a dish of something yummy’. The bowl on the right was my Mom’s Grandma Mildred Bussey’s bowl. The salt and pepper shakers also came from a family connection that holds memories for my Mom. I really like how these items reflect in the countertops. The counters are Corian in a solid pale grey. I love them and would take some just like them in a heartbeat. Mom’s glass front cabinets are filled with things that have meaning. The maxwell house mug was her Dad’s, and he white bowl under it is one almost like the one he ate his morning oatmeal in. (I remember eating oatmeal with my Grandpa a few times for breakfast!) The orange fiesta pitcher was her Mom’s. 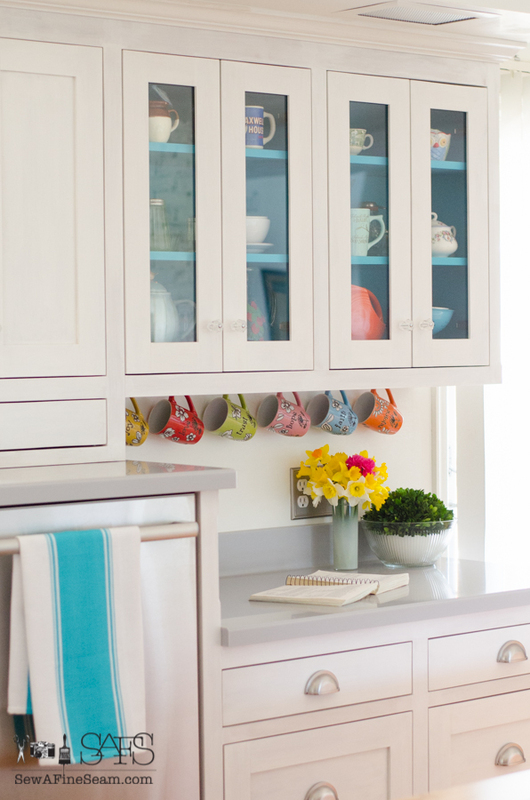 The appliance garage is so cool – and she actually has 2! The lowered counter area is where I learned to bake – on a bright yellow counter 😀 This area is still a baking area but now everything can be hidden from view when not in use. This island. Mom chose to make her island oak to contrast with the white. They decided on a butcher block top, and my cousin, the cabinet maker, ended up making it for them. 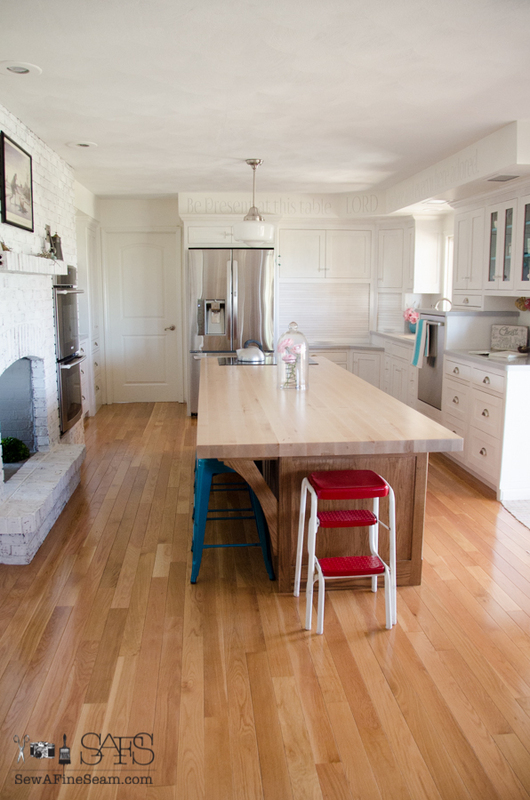 I’ve never seen such a wonderful butcher block counter. This thing is so slick and smooth you wouldn’t believe it. Seriously. This vintage stool was in the basement at Grandma Pearl’s. Mom decided to keep it when we were cleaning things out. 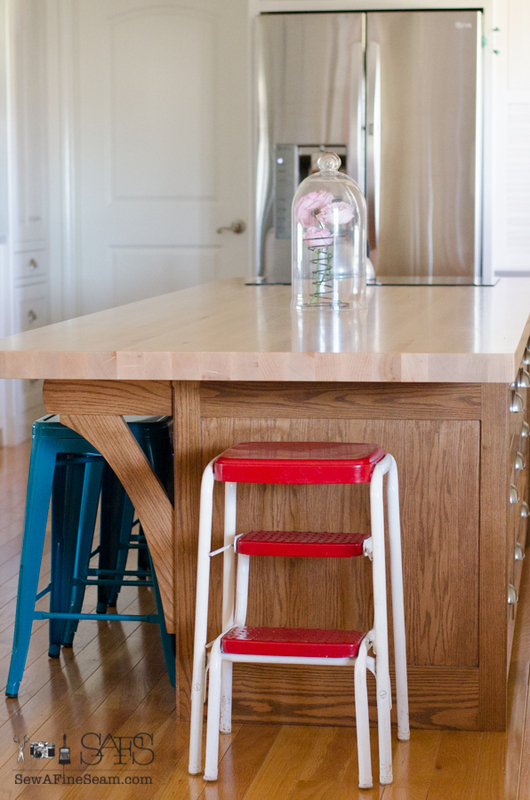 I think it goes well with her kitchen and adds a fun pop of red – I always have liked red with aqua and white. The tall door at the end, beside the 2 drawers and under the last top drawer, is actually a trash can drawer. 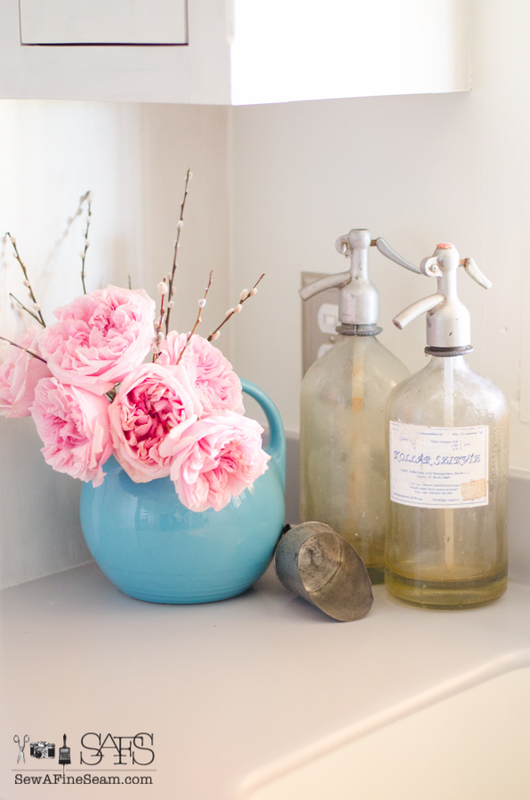 If at all possible – ADD ONE OF THESE TO YOUR KITCHEN! You can give it a nudge with your foot or hand and it pops open. Every kitchen needs this. It is also deep enough for two trash cans – another must. I really like how this light looks with everything else in this room. And it’s just perfect for my Mom too. Staging for the photo shoot was fun. I bought some cabbage roses from The Ivy League flower shop. 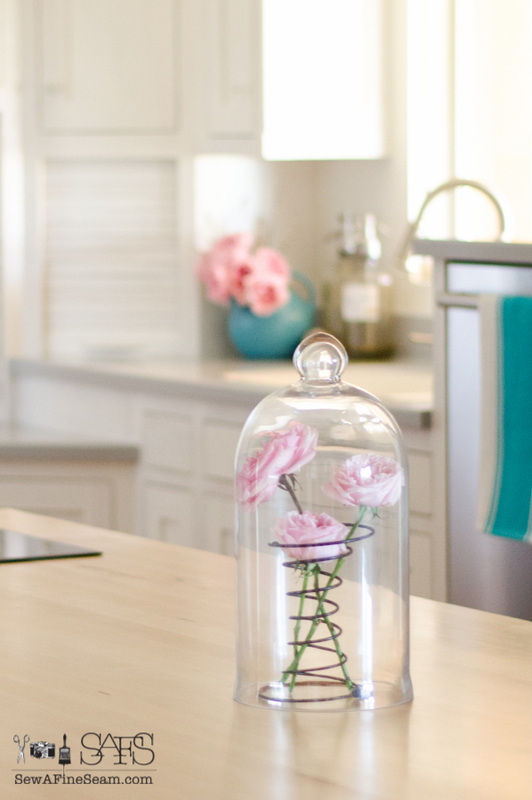 The glass cloche also came from The Ivy League – my girls and I gave it to my Mom for Christmas a couple years ago. The old spring was in my Grandpa’s stash of stuff. The aqua stools (I think they were called peacock) match the inside of the glass front cabinets almost perfectly. I’ll bring you another post with some pics of the process and talk a bit more about using milk paint soon. 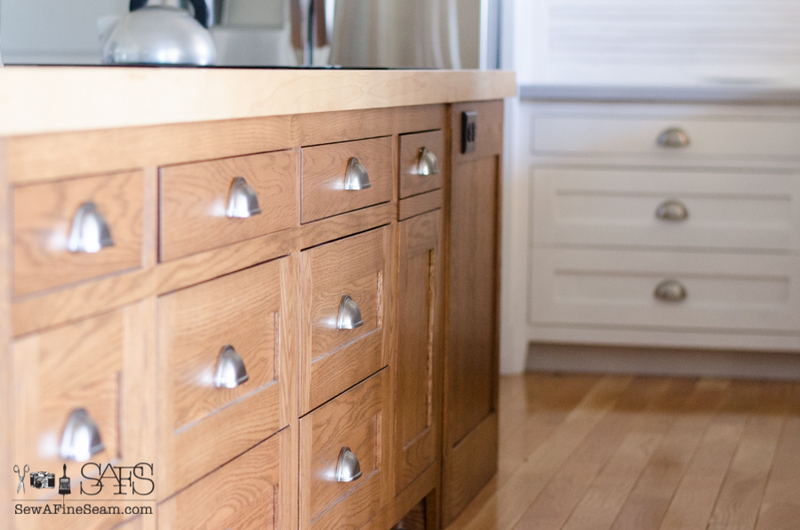 I just couldn’t wait any longer to show you this beautiful finished kitchen. The pictures are gorgeous, Jill. You did a great job shooting them. Love this post. We need to show the original carpet and appliances. What a transformation! 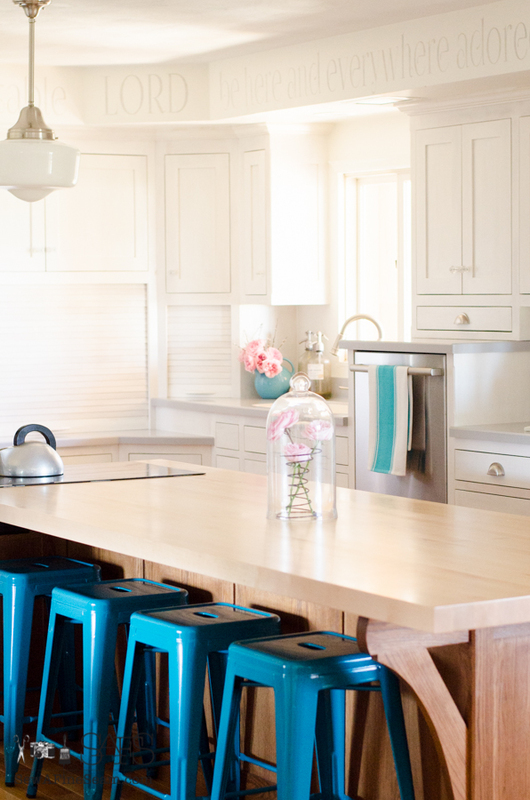 It’s even fun to do the cleanup jobs in this kitchen cause it looks so great when it’s cleaned up. It was fun – glad I finally got it done – now we need to dig out some pics of this kitchen when it was built back in the 70’s! quite quite wonderful. the photos done very nicely great lighting presents this really grand kitchen. the butcherblock countertop showed up so well. looks so slick there would never dare be a fly in that kitchen. zip right off on an attempted landing. the spaciousness of it shows but not to the detriment of the cozy feeling overall. the appliance garages, the cabinet jewels. well I must not make this into a mini book. I could just feel the happiness the end results have given to you and your mother. I’m sure my Mom would be delighted if the flies would stay away! 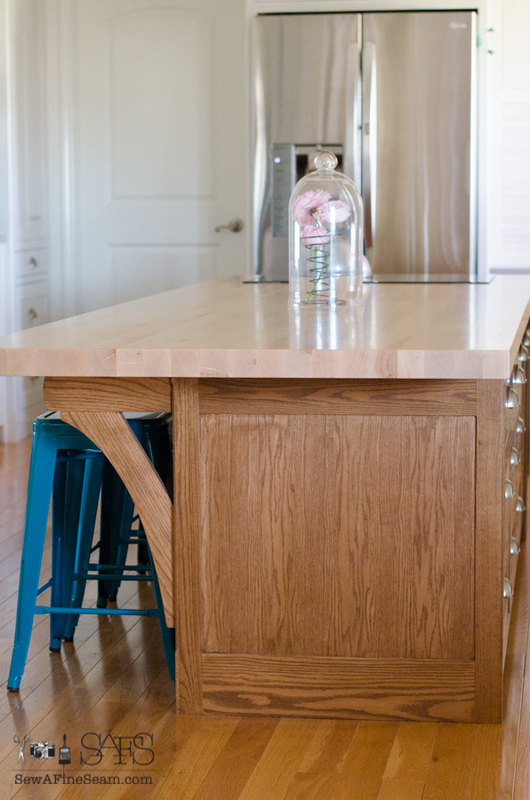 The island is so wonderful – I’ve honestly not ever seen such a wonderful finish on a butcher block. Oh I so wish I could do this with my kitchen!!! I have a harvest gold dishwasher that I haven’t used in 9 years still taking up space in my kitchen!!!! One of these days! 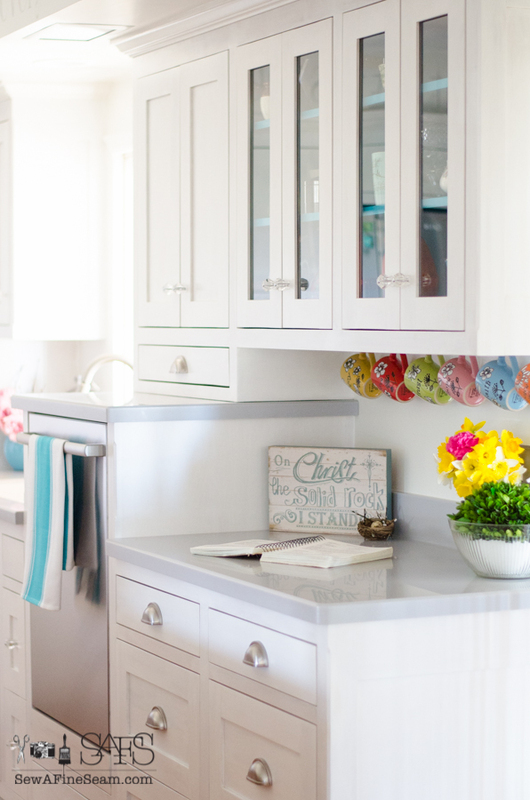 Your mom’s kitchen is fabulous…totally perfect! 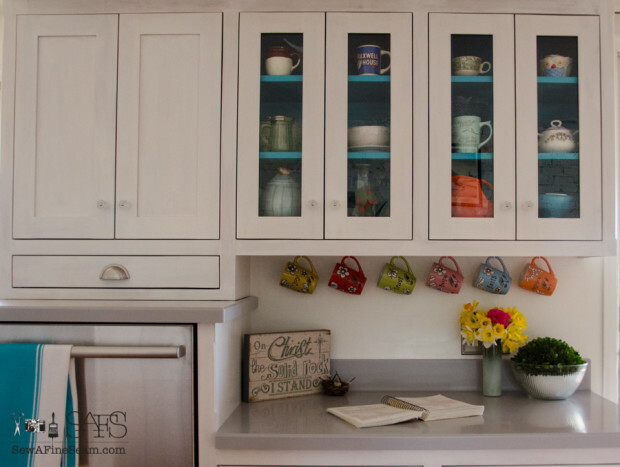 Thanks Susan – if you can’t afford new custom cabinets there are ways to paint the cabinets you have and get a high end look at a fraction of the cost of a whole new kitchen! Your mothers’ kitchen is wonderful! I know it brings her much joy. I’m cracking up Regena! The mental image of Harvest gold, Avocado green, Burnt orange and bell bottoms is just too much! 😀 😀 I’ve got to find some early pics of this kitchen – it’s so different it doesn’t even look like the same house! Your mom’s kitchen is gorgeous! I love the idea of the raised dishwasher. Maybe that would get me to actually run the dishwasher more often 🙂 Great job on the photography too!!! Your mother is very blessed to have you as her daughter! 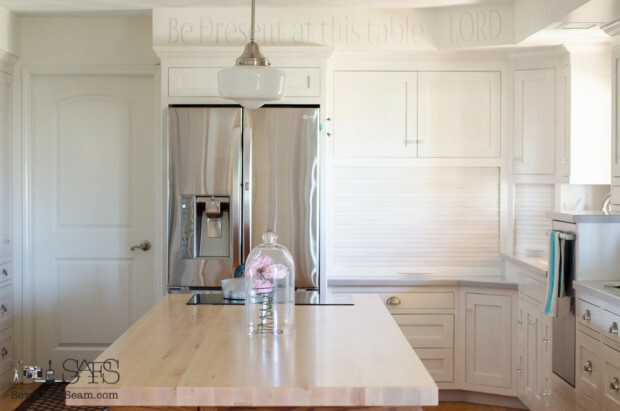 The kitchen is beautiful and your painting the cabinets is the icing on the cake! Yes, Cathy, I am very blessed and happy that Jill is my daughter. And I am doubly blessed by having two daughters! And I have to add that our son is a huge blessing, too. A Mother’s heart is always blessed by having her children’s accomplishments noticed. Thank you! Thanks Cathy! I’m blessed to have her as my Mom! Wow, what a wonderful kitchen! I’ve never seen the raised dishwasher, but that is a fantastic idea. Raise the dishwasher and lower those microwave ovens…..I’m a shorty and seem to be getting shorter as time goes by, which means our microwave is getting a bit difficult for me. Okay, you little stinker, you didn’t show us inside the “garages”…..I love those things! I agree – make it as convenient for how you need things to be as you can! I think this is my favorite kitchen ever. Gorgeous yet VERY functional at the same time. Thanks Tina! 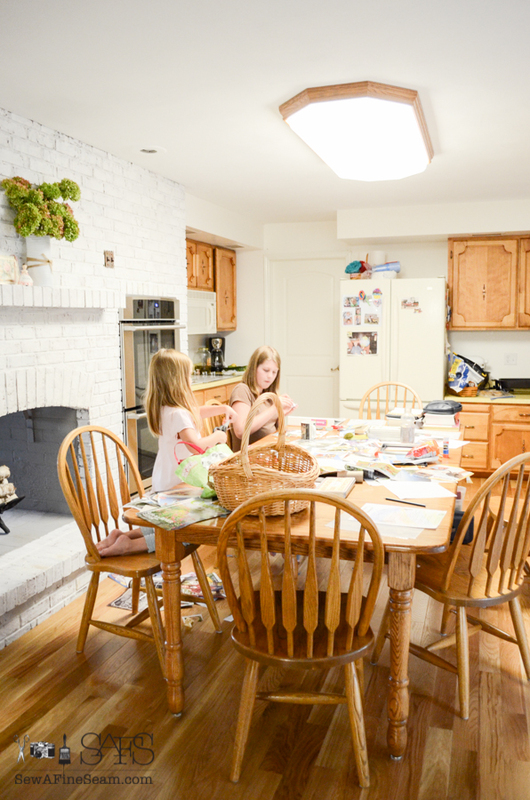 The layout of my Mom’s kitchen has always been nice for working in – now with that wonderful island it’s even better. And the fact that it’s so white and bright and lovely is pretty cool too! This post turned out beautifully, as did your mom’s kitchen! Just so refreshing with that crisp white canvas and a few pops of color! I’d be tempted to move back in! Thanks for the mention! 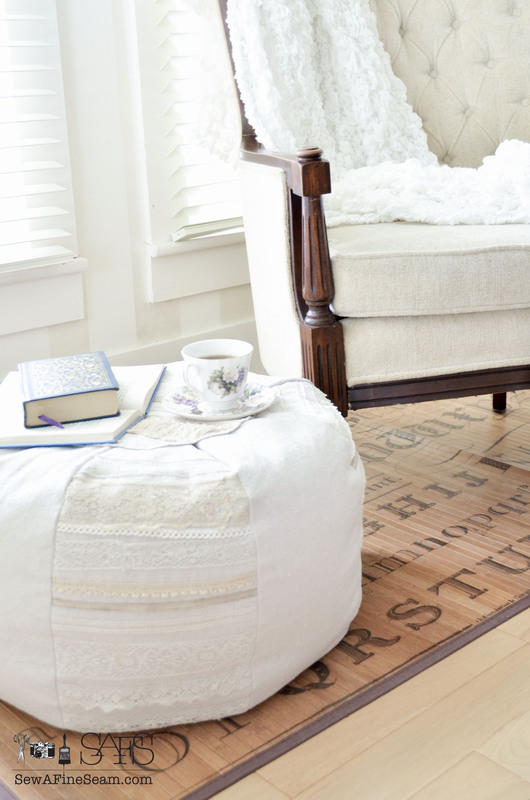 I love your ideas Jill…always thoughtful, beautiful and functional! 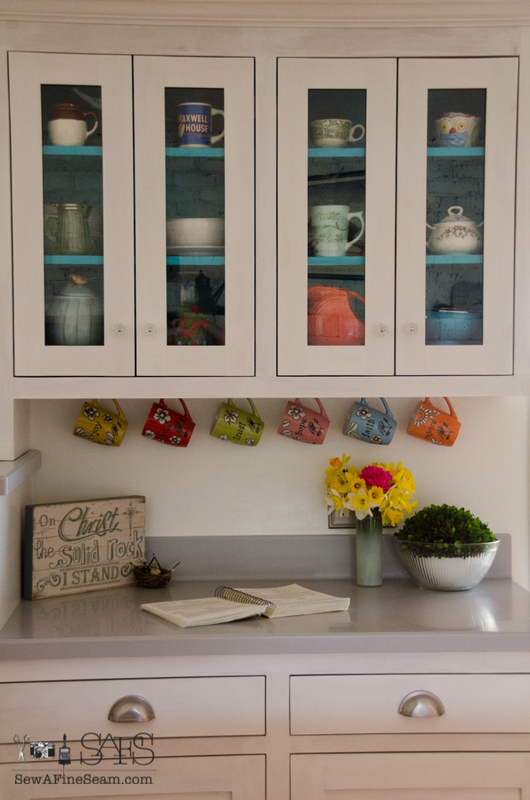 Thank you so much Cheryl Ann – it was such fun to be a part of my Mom’s kitchen makeover! I am very interested in your mother’s kitchen remodel. You spent a lot of time and energy on the cabinets, but I noticed the cabinetmaker sprayed a final coat on the cabinets that I never have had mentioned before, and that would seem to be the “icing on the cake.” What do you think? Donna, my Mom’s cabinets were custom made in a cabinet shop. If they had been oak or cherry or some wood she wanted a stain and varnish finish on they would have been sprayed with a finish. So I asked the cabinet maker to let me paint them with milk paint and then for him to spray them with the finish like he would if he had stained them. 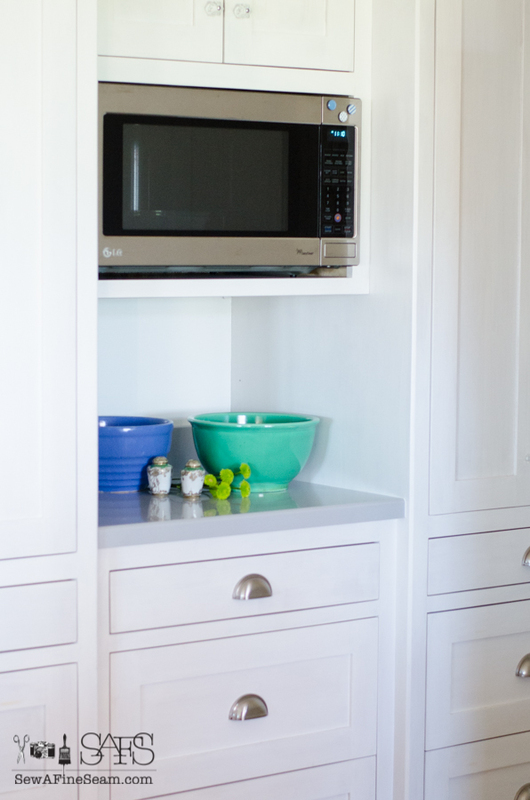 Because this was a brand-new, custom project instead of just redoing existing cabinets, this was the best and easiest way to get a finish on the cabinets. After they were sprayed and completely finished they were installed just like any custom cabinet job. YEs, that finish is amazing and the best you can get. 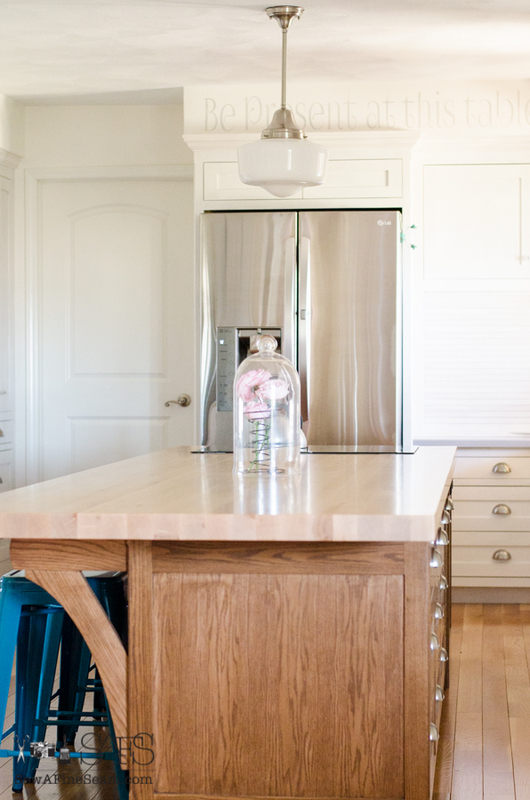 It’s not an option though with a kitchen makeover of existing cabinets if that makes sense? I love, love all the pictures! It is so pretty! So happy for Mother. The stools are so much fun! All of them! Turquoise and the old red one. 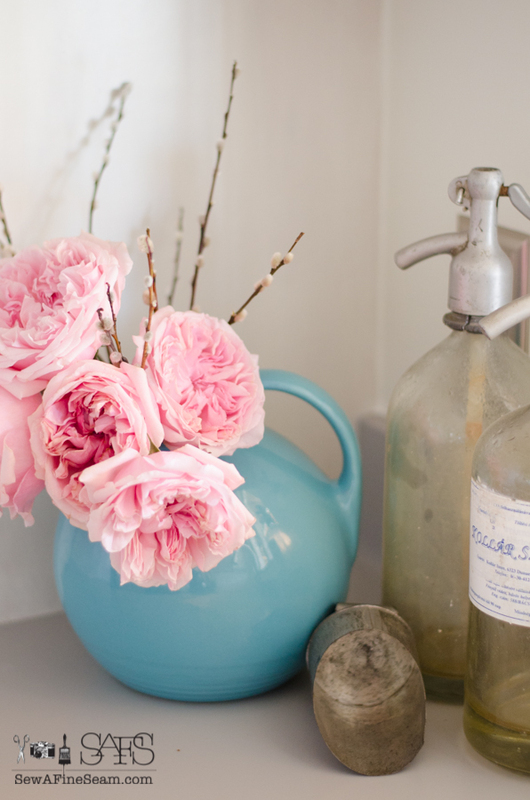 I love all the vintage family touches. And the aqua/turquoise touches are so pretty. 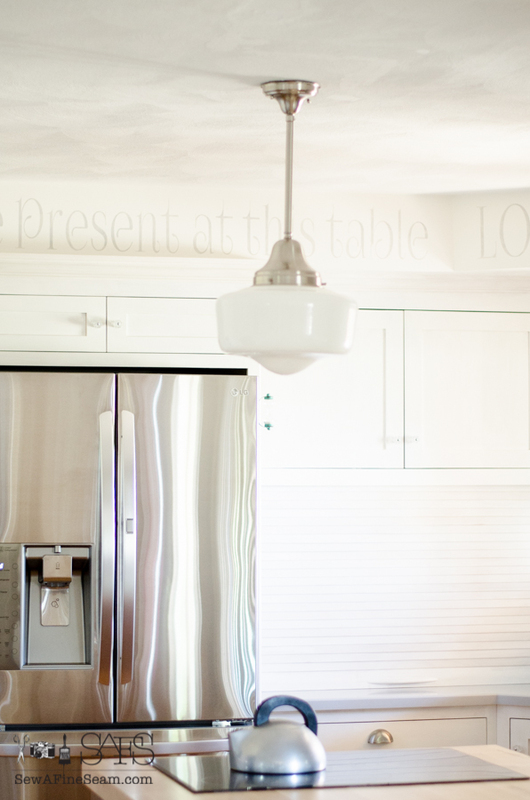 White kitchens are the best for photography! I love my kitchen to pieces, but it is not a good photo studio. Oh well, I snap away anyway! You did such a great job on the cabinets as did the cabinet maker! This project was so fun. It was a lot of work but I enjoyed it immensely. Jill your kitchen is amazing! 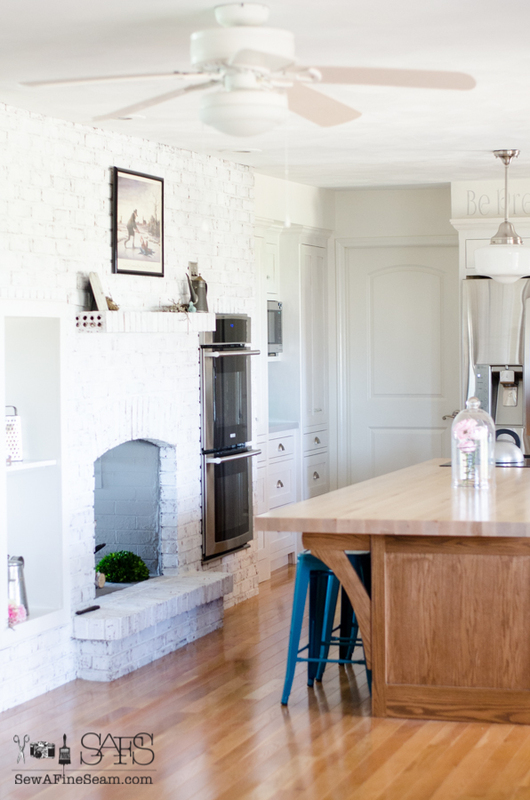 The color you picked is great and oh my to have a fireplace in the kitchen is just dreamy. 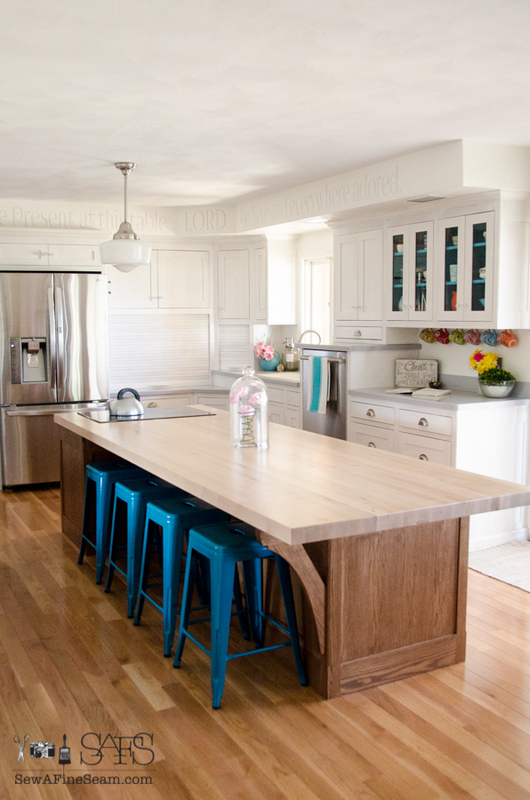 Thanks Pamela – my Mom is loving her new kitchen very much and it was so fun to be such a big part of it. Gorgeous! Your mom must be thrilled to have such a lovely new, light, bright, elegant space…and that fireplace, used or not, amazing! 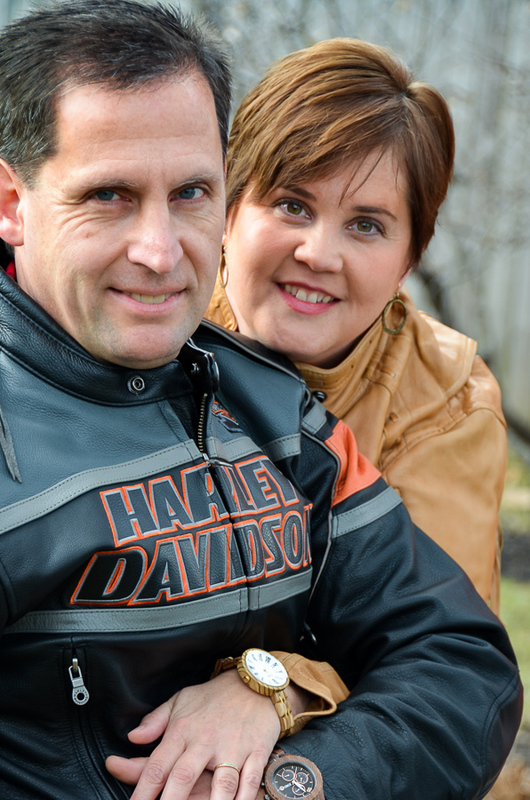 Thanks Kim – Mom does love her kitchen so much!